Recently named as one of the top producers of Fulbright Scholars in the nation, UNT has a proud heritage of faculty who serve as cultural ambassadors through the exchange of educational innovations and research. 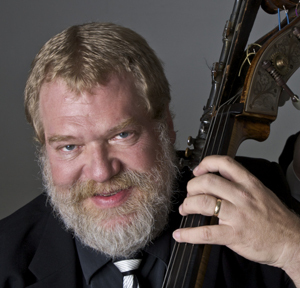 Lynn Seaton, professor of Jazz Studies, was recently awarded a Fulbright, allowing him to teach and perform at the Jāzeps Vītols Latvian Academy of Music in Riga, Latvia during fall 2014. 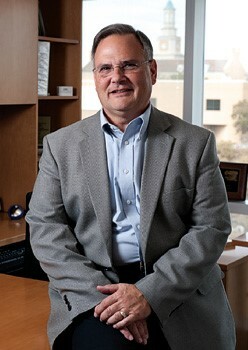 Seaton is one of six UNT-system employees to receive a Fulbright in 2014, putting UNT on the map among top research universities. If you are interested in learning more about the Fulbright Scholar Program, contact UNT-International (Mary Beth.Butler@unt.edu) for application forms and upcoming workshops. Enjoy learning more about Seaton’s Fulbright here. Are you interested in designing or redesigning a course? Do you need a space with support, tools, and resources to design and develop your course? Then, make sure to put CLEAR's Course Design Institute on your summer calendar. CLEAR CDI will involve a week of face-to-face interaction proceeded by online modules in the TREE program. You must apply to attend and financial support is available. Click here to see the different ways you can participate and apply today. Funding for the 2015-16 Mentoring Grant Program is available to all full-time faculty for both individual and team grants. To learn more about how these grants can help improve your teaching or scholarly efforts, please attend an information session on March 25, 2015, 10:00 a.m. - 11:00 a.m., BLB 050. Proposals are due on April 3, 2015. Specific questions may be directed to faculty.success@unt.edu. The workshop, moderated by Angela Wilson, Regents Professor of Chemistry is scheduled for March 27, 2015, 1:00 p.m. - 2:30 p.m., Gateway 42. Register here! First 10 registrants will receive a copy of Jim Denney's book, Writing in Overdrive: Write Faster, Write Freely, Write Brilliantly. 'Get Funded' Workshop Rescheduled for April 16th! The workshop, moderated by Angela Wilson, Regents Professor of Chemistry, is rescheduled for April 16, 2015, 3:30 p.m. - 5:00 p.m., BLB 260. Register here. If you have questions, please contact faculty.success@unt.edu or Angela.Wilson@unt.edu. Faculty, students, and staff at UNT have a new option for publishing their works of scholarship. Eagle Editions, an imprint of the UNT libraries, offers works free to read online and allows authors and editors to sell print and e-book versions as well. The cost to publish varies depending on the services desired and the length and complexity of the work. Please visit the Eagle Editions website or contact Kevin.Hawkins@unt.edu for more information. The 2015 Charn Fund Request for Proposals seeks projects that will contribute to the comprehensive globalization of UNT. Competitive proposals will have broad impact on the internationalization of UNT's curriculum, enable capacity building that aids UNT in becoming a leader in global education, and demonstrate measurable learning outcomes. Preference will be given to proposals that demonstrate measurable impact and involve collaborative efforts across academic and support service units. UNT full-time faculty, lecturers, and staff are encouraged to apply. The proposal submission deadline is March 23, 2015 by 5:00 p.m. Please direct any inquiries to Amanda White Bennett at Amanda.White@unt.edu or (940) 369-5292 . 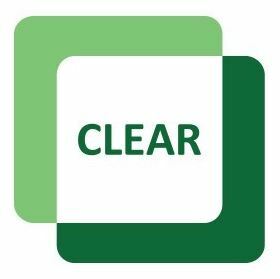 Save-the-Date for Upcoming CLEAR Events! TWU's Annual Academic Success Lecture: UNT faculty and staff are invited to TWU's Annual Academic Success Lecture on Friday, March 27, 2015, from 9:30 a.m. - 3:30 p.m. Dr Rena Palloff of Fielding Graduate University will present a lecture in the morning session, followed by lunch and a presentation from Blackboard. The afternoon session will include a hands-on workshop lead by Dr. Palloff. Registration and details are provided here. University Forum on Teaching & Learning: Save the Date for this half-day event designed to enable faculty, graduate teaching fellows, and staff involved in supporting teaching and learning. Participants will engage in open dialogue about the challenges of teaching and share ideas and practices that improve teaching effectiveness. The forum will feature keynote speaker George Seimens (digital learning expert). on April 10, 2015 from 8:30 a.m. - 12:00 p.m. in Gateway Ballroom 035. Registration is now open and can be found here. Call for 2015-16 Proposals for NextGen Course Redesign Grants: NextGen utilizes an innovative three-tier model of student learning outcomes, outcome-based instruction, and assessment that promotes deeper connection with course content, instructors, and peers. Beginning in February, CLEAR will be accepting applications on a rolling basis until April 30, 2015. For additional information, questions, or concerns, please contact the NextGen Program Manager at Jenna.Ledford@unt.edu or our website here. It’s Midterm: Does Your Teaching Need a Boost? is enrolled in 100% online or off-campus courses. Chances are you have many non-traditional students in your classes who may face significant challenges making campus connections and engaging with faculty. 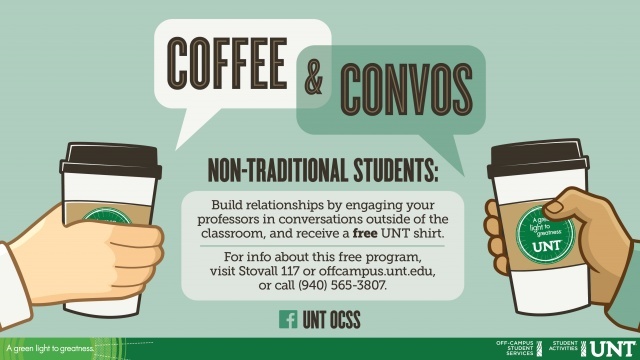 The Student Activities Center is offering "Coffee & Convos," an innovative program to encourage relationship building between professors and students. For more information, refer students to Stovall Hall 117 or offcampus.unt.edu. Texas Women in Higher Education Conference, March 29-31, Location: Galveston, TX.